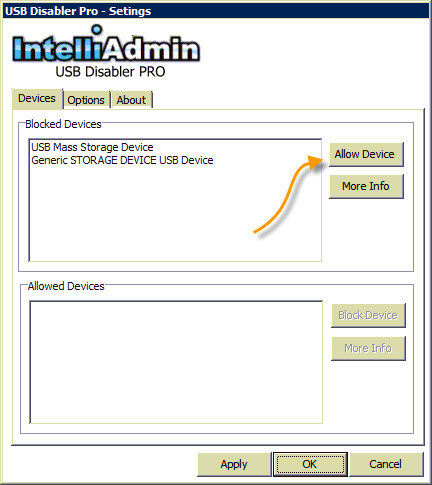 IntelliAdmin USB Disabler Pro allows you to take control of your network and prevent unauthorized use of USB flash drives and memory sticks, without interfering with keyboards, scanners, or mice. The account you select will have the ability to allow, or deny access to specific devices, change settings, and if it is enabled, all USB devices will be available to them while they are logged in. 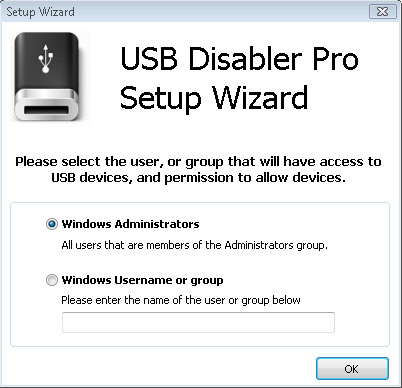 The setup wizard picks the ‘Administrators’ group as the default option. You can select your own custom security group by selecting the second option and typing in its name. 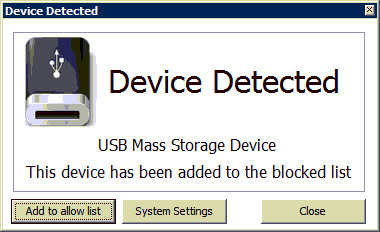 Once you click OK, USB Disabler is active and ready to block access to USB flash drives when they are plugged in. -The ‘Administrators’ group is picked as the security group. -Users are prompted when inserting a device. -When administrators log in they get full access to all USB devices. 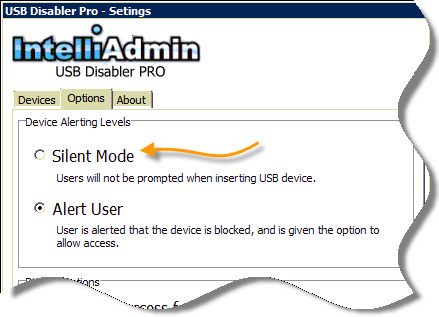 AlertLevel – Determines if the user is prompted when a USB device is inserted. If this value is set to 1, they are prompted. If it is set to 0 the device is automatically disabled with no prompts. AdminLevel – Determines if administrators get full access to devices, or the devices follow the same blocking rules as non administrators. If this is set to 1, administrators are allowed to access any USB device when they are logged in. If this is set to 0 an administrator needs to manually add a device to the allow list before they can use it. The above options will disable all prompts. This means members of the IT Group will always have access to any USB flash drive, while those not in it will have no flash drive access. 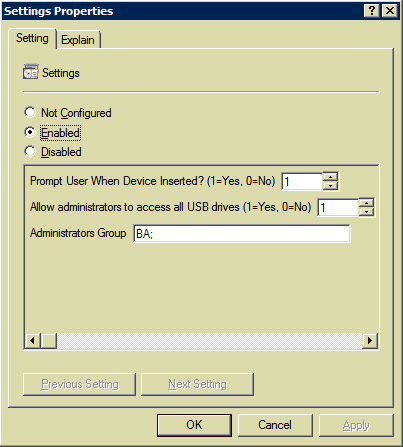 Group policy can be used to deploy USB Disabler across your network. This in conjunction with the group policy ADM template it is easy to manage USB Disabler over large networks. To install USB Disabler using group policy, download the file to a location available to a domain controller. 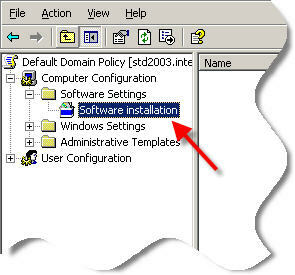 In these instructions, the software will be installed on the entire domain. What you need to do next depends on your version of windows. 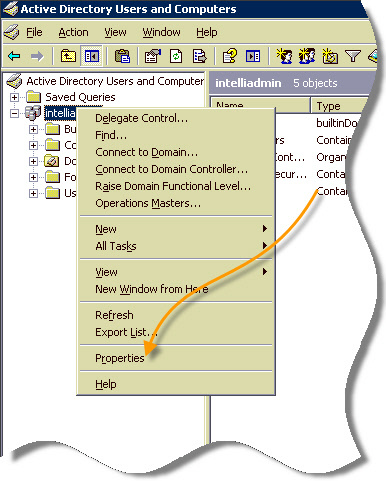 For Windows 2008, click on the start menu, then Administrative tools, and finally "Group Policy Management"
Then drill down to Domains -> [Your Domain] -> Group Policy Objects. Right click on Default Domain Policy and click edit. The group policy editor will be displayed. Click edit, and the group policy editor is displayed. From this point 2003, and 2008 have the same instructions. Now, before you can continue, you need to place the USBDisablerPro.msi file on a public share that all computers can access. Once you have completed this, right click on the "Software Installation" line item. Select new, then package. You will be prompted to select a MSI file. Select the file by pointing it directly to the share you are going to deploy it from. 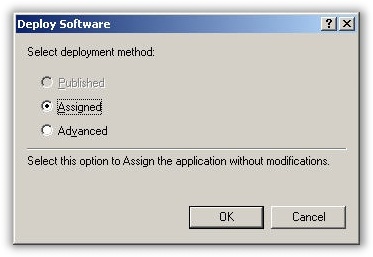 When you press OK, it will ask you for the deployment method. Pick "Assigned"
Click OK. Now, machines that are within the scope of this policy will have USB Disabler automatically installed. 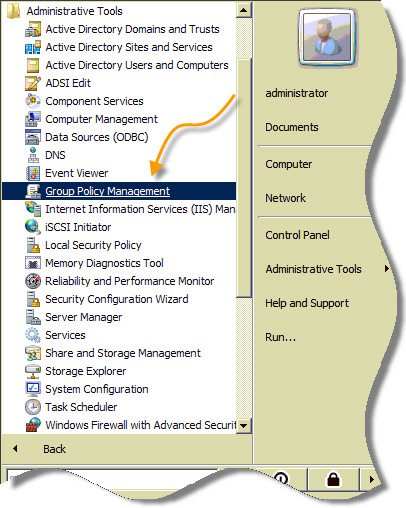 Locking down settings using group policy. Using group policy you can force settings. Once the group policy adm template is used, USB Disabler will follow those and ignore any settings provided via the command line or the settings form. Once you have downloaded it, open the group policy for the machines you want to configure. 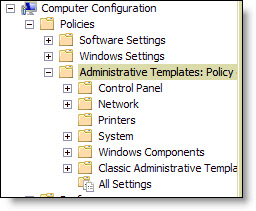 (See "Using group policy to deploy" for instructions on how to open group policy). 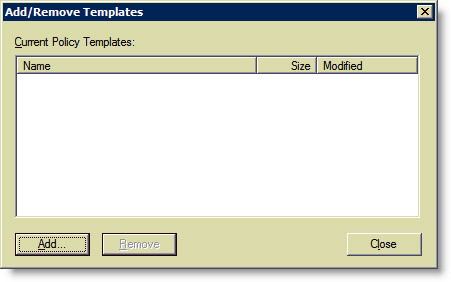 Now you are shown a list of custom templates that have been installed. In this screen shot, nothing has been installed. Now you are ready to make changes. Click on the new folder titled "IntelliAdmin USB Disabler Pro", and an icon named "Settings" will appear on the right. Switch the options to enabled, and you can make changes. Notice that the default group is "BA". This is an internal name that windows uses for Administrators. It is important that you use this name if you have versions of windows that are other than English. If you want to add additional user names or groups simply type them in and separate them by semicolons. Once you click OK, the settings will be applied across your network. 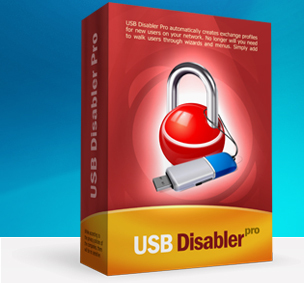 The default installation allows USB Disabler Administrators to access *all* USB drives. This means if a user logs in, inserts a device, they can access it immediately if the are an administrator. If they are not an administrator they will be prompted that the device was disabled, and the device will need to be added to the allowed list before they can access it. You may want all users, including administrators, not to have access unless they explicitly add a device to the allowed list. This can be accomplished by changing the disable options to "Block all Users"
Once this option is selected, administrators will need to add a device to the allow list before they can use it. Click "Add to allow list" to allow the device. To allow a device, simply click on the device and click "Allow Device". Click OK and the device will be enabled. If you still have questions please feel free to email us at support@intelliadmin.com We are happy to help.